Greetings from the Owens family. We hope that you all had a good Christmas and are looking forward to the start of a new year! We enjoyed celebrating Christmas this year with our family, a blessing we don't take for granted. We were fortunate to have Kendal's mom come stay with us, so we got to have Christmas with her as well as all of Chad's family. The holiday was bittersweet as we missed Kendal's dad being a part of it, but we did enjoy seeing many extended family. We know that the first holidays after losing a loved one are tough, but we praise the Lord that Christ's birth (and subsequent death) brought redemption and renewal. I Peter 5:10 tells us "After you have suffered for a little while, the God of all grace, who called you to His eternal glory in Christ, will Himself perfect,confirm, strengthen and establish you." Because of that baby born in a humble manger, we have the promise of eternal life. We rejoice that Kendal's dad shared that promise too. As we look forward to welcoming 2015, we look expectantly to what the Lord will do and how He will use us. Our plan is to return to PNG in late June/early July. We look forward to continuing our work both here in the US and in Papua New Guinea. For the first half of 2015 our work will include sharing with others about Bible translation in Papua New Guinea. The needs there are still great with over 200 languages in PNG still needing a Bible translation project. Recently, we had a chance to share at an Awana group. We asked the kids "what do you want to be when you grow up?" As they shared their answers, we shared how someone with those skills could be used to support Bible translation. It was a fun way to illustrate that whatever skills God has given you, everyone can have a role in the work of Bible translation. Finance update: In order to return to PNG mid year, we have a significant amount of monthly support and one-time financial needs that must be met before we can return to PNG. Please pray for us as we seek to grow our team of partners. If you have a church, Bible study group, or just a group of friends who'd like to hear about how God is moving in PNG, please let us know. We love to talk about what we do! Increase Needed: $2680 p/month. Job update: Once we return to PNG in July (Lord willing) Kendal plans to return to the school serving as part of the admin team and working as the school registrar. We ask for your prayer and thoughts as until last week, Chad was planning on returning to be working in Audio/Video Bible creation, when he got a surprise invitation to a leadership role. Two days ago, Chad was asked to take on a position of leadership. We are currently praying about it, and wanting to know how you, our support base would feel about Chad moving from audio/video into leadership. Good leadership is important in furthering Bible Translation in PNG, but it means he will be changing from what he is currently doing in Audio/Video. Also on our minds is that fact that recently 2 new staff have joined the Audio/Video team, so staffing there is not as dire as the need in the leadership. It is a weighty decision that needs to be made, and if you have thoughts or concerns, please email them to us as we prayerfully consider this decision. We look forward to returning to PNG and are praying that our financial support gets to where it needs to be so we can return in July! Kid update:Sydney and Calvin are enjoying their time here in the US, especially spending time with family, but are also looking forward to returning to PNG. Having spent more than half their lives there now, PNG has become home to them. Happy New Year: New Years is typically a time to reflect on the past year and look expectantly toward the upcoming year. Recently, a friend challenged me (Kendal) to choose "one word" for the 2015. Rather than making resolutions (that often get broken), I've decided to embrace this idea of choosing one word to focus on for the year 2015. The word I've chosen for the new year is RENEWED. (Isaiah 40:31, Psalm 5:10, 2 Corinthians 4:16). We pray that you also will be RENEWED in the coming year as you seek to follow the Lord's leading in your life! -Our monthly financial support commitment needs to increase in order to return. -Chad needs help deciding on a job change in PNG. -Please pray for Kendal's emotional healing. -That God would send some good new friends to our kids, both in the U.S. and in PNG. 2 - donate through the Wycliffe website following the 'how to' directions below. All donations given with a credit card, have an immediate 3% fee taken from our end to cover the cost of a credit card. Debit cards incur no such fee, neither do checks. down where it says 'search for a missionary' type in "Chad and Kendal Owens"
Thank you, for all that you mean to us and all that you do! 22 And when the time came for their purification according to the Law of Moses, they brought him up to Jerusalem to present him to the Lord 23 (as it is written in the Law of the Lord, "Every male who first opens the womb shall be called holy to the Lord") 24 and to offer a sacrifice according to what is said in the Law of the Lord, "a pair of turtledoves, or two young pigeons." It struck me 'what is the significance of 2 Turtledoves?' Obviously I know the song 12 Days of Christmas, and so this phrase jumps out at us. It rings back to Hebrew tradition (on which I am no expert) in which a sacrifice must be made much like we may do a modern day baby dedication. Turtledoves are interesting for 2 reasons. They were easier to come by than pigeons, because they were plentiful. Which makes them a humble sacrifice, even the poor could find and sacrifice turtledoves. From its habit of pairing for life, and its fidelity to its mate, the turtle-dove was a symbol of purity and an appropriate offering. Because of their behavior, and the PAIR being sacrificed, they represent a covenant, a 2 person promise relationship between the child and God. One of purity and fidelity. Christ's parents were committing him to God, in a humble way, and in a way that was a binding promise. Having researched that recently, the song will never mean the same to me when I sing 'two turtledoves'….. I've been a Christian for 36 years. And yet the Word of God constantly is holding new treasures for me to discover! I am thinking this Christmas about the people in PNG who can read the Nativity Story for the first time in their heart language… ever. I've read it every Christmas for my entire life, but this year, will be their first year! That is amazing to me, and I'm thankful to God for the gift of all of you, who encourage us and help us in the mission of getting God's Word to the folks in PNG. Tired of the same old Christmas exchange games, and desiring to make Christmas exchange gifts FUN again, my wife and I invented this new game. Feel free to try it out if you're hosting a party. Go and pick up some gifts from the dollar store, one for each guest coming. If it's a large party, this may not work well, as it's always hard to explain RULES to games in a large party environment. The more people play along, and chime in, the more fun the game will be. As with most games, the more people bring to the game, the more fun it is. On the table there are X number of unwrapped decorative boxes with various gifts inside, topped with removable lids. 1 take a box from the center table, open it and look inside NOT revealing the contents to anyone else. 5 Keep your gift and do nothing. Play continues in a round, asking each player in turn. 6 - freeze your gift and cease to answer questions. The gift is then frozen and no longer eligible for stealing, and the player no longer has a turn. They are skipped over until the game ends. If the player chooses not to use option 6, then their play continues on, and they can continue answering questions and swapping gifts until they either use option 6, or the game ends. The Game ends when everyone has answered 3 trivia questions correctly (for smaller groups, 4 questions correctly). TL;DR means "Too Long, Didn't Read"
There is a vernacular that exists inside of the 'online' community. Speech shortcuts, colloquialisms, acronyms, that speed up communication. Accompanying that, everyone has their own personal screens (iphones, ipads, etc) and so are more prone to get bored with what you're saying. The end result is, you have about 15 seconds to grab the attention of someone in the U.S. or online community these days. I however, have been honing my online communication to be much more verbose, because of the community I live in. It is very easy to be misunderstood online, especially given the environment I live in, so I have taken steps to try to avoid miscommunication because of brevity. Which ironically is exactly what the people I'm spending time amongst now, value. All that means... my emails, my blogs, my EVERYTHING is possibly too long for most of the people in the U.S. Speaking with me, or my family, requires much more patience from people here in the U.S. because of these new speech patterns we've learned. Ironically, you would find it very hard to communicate with a Papua New Guinean. Repetition is a key part of their speech patterns, whereas here, repetition would be boring or distracting. As a result, I've gotten this sense of 'if I'm speaking to one of my family or friends here in the U.S., I have to speak quickly or I will lose them.' as compared to PNG, where I have to speak clearly, and repetitively or I will lose them. Two very different styles of speaking! I'm finding it just one among many other things to adjust to. I'm sure there's more to it... and I have a whole other theory about that, maybe a different blog post on my theory of humor references and movie quotes. In the last 2 years, people have asked me a question and said 'What do you think about THIS?' And I have replied "well let me tell you, I could write a book on that topic!". Knowing that I had written a book about it already, but never really sure if I wanted all the problems that may come with having written published book that may be considered a bit 'edgy'. So it sat.... and sat.... I toyed with it, edited it a bit, but really, what are the odds that publishing this book might bring more grief than good? I decided to let the internet community decide if my book should ever see the light of day. Why would it be 'edgy'? For one reason, though I appreciate organizations and what they do, I don't feel beholdin' to them to toe any company lines. I prefer to speak the truth as I see it. It may be unpopular to say some of the things I've said, in the way I've said them. I'm not always the most diplomatic, nor do I ever try to put positive spin on things. I do not purposely speak ill of anyone or anything, and I purposely leave out proper names in the writing of this book because I do not wish to cause trouble, but at the same time, I won't pull the punches on any truth that needs to be said. It isn't always nice to show things in a certain light. My chapter on missionaries smelling funny might offend some other missionaries and I might as a result get emails about it. But hopefully they will keep in mind, that I too am considered a 'missionary' and I too, smell funny from time to time. Another reason it may be considered 'edgy' is because I tell stories and say things that most of us don't exactly tell everyone. It is very hard to understand the stories outside of the context of being a missionary and so, people often don't tell non-missionaries some of these stories. I'm guessing I'm not being wise by writing this, but thankfully, my editors toned me down a little bit, so maybe it isn't edgy at all? 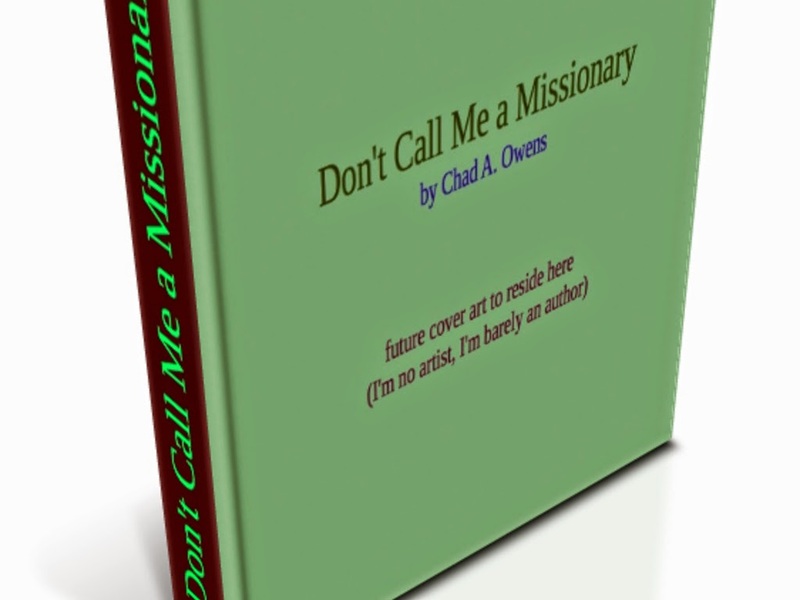 WARNING: This book isn't for missionaries. I know missionaries are super-frugal, but purchasing a book, supports the people who wrote it. The people who wrote it, are friends or share some commonality with you, which is why you want to read the book... so then why are you trying to get to read it for free? Buy a copy, shoot, buy 2 and gift one to someone who needs to read it. 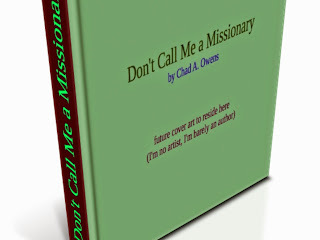 This book isn't written for missionaries. In fact, you'd probably find it offensive or worse, inaccurate. Don't read it, and don't ask for a free copy. If you chip in to publish this book, or buy a copy, I figure you paid for your right to complain. But if you got the copy for free, please keep all complaints to yourself, because you know, I didn't write the book for you. I a lousy salesman. I am telling certain people not to read my book. Being home in the U.S. for Christmas means we get to spend it with friends and family that we don't often get to see. This is the highlight of any home assignment/furlough for us. But it is definitely 'different'. We have stepped outside of our U.S. traditions, and our U.S. lifestyle and have become accustomed to a new life style, that we have crafted because we do not have family around us overseas. Our first Christmas overseas had the potential to be sad. But it wasn't! Several things conspired (as we sat by the fire) to make it unique and wonderful. Over the years, that new lifestyle has become comfortable to us. Which, has the unfortunate side effect of making our old lifestyle, uncomfortable for us. Specifically when it comes to Christmas. Overseas, we don't have t.v. advertisements, nor signs that say '10 days of shopping left until Christmas'. We don't have the hustle nor the bustle. We miss the Christmas traditions which we can't do in the U.S. (or find it very difficult to do), and so it leaves us feeling a little, out of place. But, that feeling is comforted easily by the fact that we're spending Christmas with family in their way of doing things, and it too is unique and enjoyable and good. It's hard to explain the sentiment of 'different but good'. Difference makes us uncomfortable, but goodness makes us happy. It's an awkward type of good, where we don't know exactly what is expected of us or exactly how to behave, but we're happy just being there. 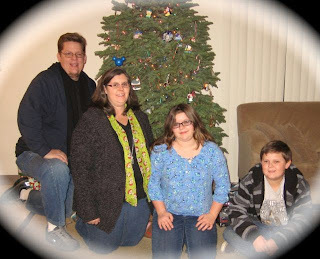 I write this because part of this blog is explaining the lifestyle of a missionary. Christmas is good, but different. Not entirely new, many things are old and familiar, but still different, and yet, many things are new. Kids are older, grandparents are no longer with us, people are married, new children were brought into the world. So there is newness to it as well. If I had to pin down the single difference, it would be that in the U.S. it feels as if people are less accessible. For whatever reason, maybe they're too busy, or they have too many distractions, but it is a rarity that you sit down with someone, and just talk, for however long you have to talk, about important and serious things. To pray for one another, to uplift one another. It just, doesn't happen very often at all. We've been in the U.S. for nearly 6 months now, and there are still a great many people we haven't been able to see because schedules conflict. Either we're on the road speaking at places, or they're busy with their lives. It is very hard to re-insert yourself into lives you've willingly stepped out of. It's our own doing we know. We miss visiting. I mean real let-the-dishes-sit-for-a-while-whilst-we-chat, visiting. In Ukarumpa this happens regularly. Never so much as around Christmas. Christmas eve, we get together with friends, and go to church. Christmas day, we have a few friends over and they stay, through brunch and dinner. They stay until the sun goes down and we just visit. I mean we play games, throw the football, sit and talk, laugh, eat, kids playing, it's an all day thing... and you never really want it to end. I often plan events for the kids for when they seem to get bored, magic tricks, games, etc. We're talking marathon visits here, not just a few hours. Then, the next day, boxing day, we do it all again with different friends. Christmas for us, is an entire week of non-stop visiting with people. There is an edge to being overseas that makes people more prone to opening up quickly to people they trust. Perhaps it's the fact that people come and go quickly, but you can't really afford a 'warming up period.' You can't waste time talking about weather and traffic (two topics which are extremely dull in a tropical environment where there is no traffic and the weather never changed. ), you have no where to go but right to meaty issues that matter. I'm not complaining about Christmas in the U.S. at all. Please do not see this as a judgement or a complaint. Had we never left for overseas, I'm certain we'd never even notice a difference at all. I'm trying to share insight with you about our view on Christmas. In the U.S. we have more awesomeness to behold. Cool lights, nice treats, yummy drinks, christmas music on the radio, good family and friends, and more gifts to give and receive, it's awesome. We have become accustomed to chatting with people for hours, but in the U.S. that doesn't happen as often, life is just in the way. Fair trade? You decide. For us, it is very hard to like one way more than the other. Ask our kids. If they could have our family, over in PNG, life would be perfect for them. (-; The best of both worlds, combined! Overseas, we have a more subdued, quiet Christmas. For some that may seem really boring, we find it delightful. This Christmas, I would challenge you to have a really good conversation with someone about important things that matter to you, make a deeper connection with someone. I think that will enhance your Christmas time. Christ came to earth and became human, and part of being human is connecting through relationships. He grew up and told us to love one another. Love is truly the only thing that reaches through all the garbage of life and makes change happen. It is more than how you feel towards someone, but also how you act. It is listening to each others' burdens, encouraging one another and praying for one another. It's sharing enough life experience together that you have a lot of inside jokes, and fond memories. This Christmas, just love on somebody, the way Christ would. It'll wash away all the silliness we put ourselves through at Christmas and really get down to the importance of it. What better time to show someone love than on Christmas? For many years now, I've been a fan of some of the higher end Christmas light displays and the hardware/software that goes with it. I always thought it would be a lot of fun, figuring out the puzzle of how to program my own songs to light the zones exactly how I wanted. I've come back to the U.S. to find that now, most people can do this if they have the budget. No longer is lighting, electrical or computer software experience a must. It honestly makes me feel a little outdated… sort of like, when you've spent a year learning object oriented programming and then find out that they're teaching it in 2nd grade now with a drag n drop app. But, this place, this lighting place rekindled the amazement I felt as a kid seeing lights. Technically head and shoulders above anything I've ever seen. We could have sat there all night and watched this. Kudos to you guys! How long until everyone has one of these? One thing we don't see a lot of living overseas, is Christmas lights. 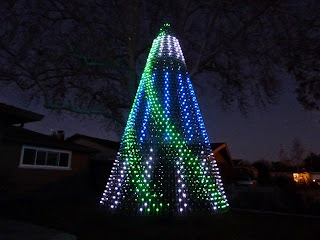 Specifically, people adorning their homes with external lights, that you can drive around and go see. Electricity in PNG is pricey and so we tend not to put up a lot of lights. Our family has a great many Christmas traditions and one of them is to go around our little center looking at lights. Kendal makes up some hot cocoa, I load the mp3 with Christmas songs (no radio stations to listen to), rig up the car with speakers, and we begin to drive. 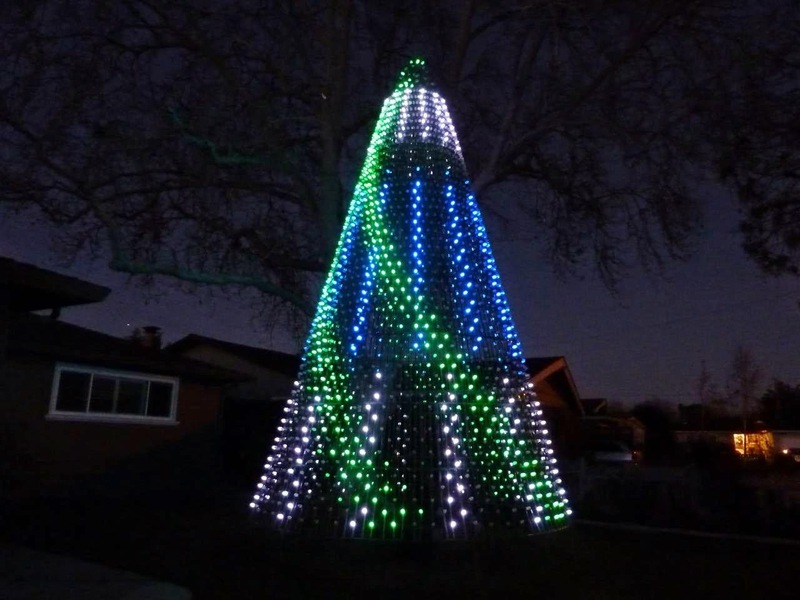 Last year we were responsible for the first ever Ukarumpa traffic jam, because we announced to the neighborhood that we would be out looking and to please turn on your lights. And several others decided to follow suit, and thus, everyone was out looking at lights. IT WAS SO AWESOME! This year, we're in the U.S. on furlough. And it'll be our last Christmas in the U.S. until my daughter graduates High School. Which may in fact mean, this is our last chance in the U.S. to look at Christmas lights. So, being the dad that I am… I'm pulling out all the stops!! 3. http://gebweb.net/optimap/ - will use google maps, allow you to put in several locations and then calculate the best round trip route for you! So.. using these three tools I've come up with the absolute BEST 36 minute round trip tree lighting route, full of the best places in the area to see! This is going to be the BEST EVER. I'll post our results and reactions soon. I can already tell you this, I remember when syncing your lights to an FM broadcast was special and rare and you drove a long way to see it. Now it seems like a lot of people are doing it. I recall wanting to develop my own software to do it, and now I see you can buy kits. It makes me feel like the world is passing me up just a little bit…. things that once were cutting edge are now, normal. It's interesting how being away 4 years can have that affect. Still, we enjoy the opportunities the U.S. has to offer while we can! I try. But I fall short, I think primarily because my goal in giving gifts is to create memories. There are a few people out there who if ever asked "What is the most memorable gift you ever received?" would give the answer of one of my gifts. But that isn't always a good thing. Sometimes my gifts are memorable because they are odd. For me, a gift is about creating a memory. I think hard on a gift, and then think about how to deliver it, wrap it, etc. I almost never wrap a gift in the traditional-perfectly-wrapped-gift method. Because that won't be memorable. Instead, I might tear the paper up, or wad it, or use scraps, or somehow make it wonky so when you look at it your brain is already working "okay this is different, this is odd." There was a year when my sister had a reputation for returning certain articles of clothing, so, I bought her several gift certificates, which she would enjoy, but to make it memorable, I taped each one to a different canned meat, and wrapped that. So the bigger the value of the cert, the bigger the meat. There was a canned ham, spam, and some canned fish. One year I made a gift memorable without meaning to, in giving my nephews Pig Teeth necklaces from PNG, I almost traumatized them. Whoops! Why do I approach gift giving this way? Yes I like to give people things that they'll enjoy…. but the novelty of new things fades quickly. A memory lasts much longer. As we celebrate Christmas, we are rekindling a memory of something important that happened so long ago. Christ was born! That should amaze you still! You should be able to fondly look back at that gift, and at the time you accepted that gift, with the same wonderment of Christmas morning to a child. We give gifts because it makes Christmas magical, but even without a single gift, it already is magical, and memorable, because Christ did it best. He gave us a gift we were not expecting, in a way we were not expecting it, wrapped in a non-traditional bundle, born in a non-traditional place! Tradition is good, when it points to the right place. My tradition as odd as it may be, has always been meant to disrespect the 'stuff' a little bit, but respect the 'idea' behind the stuff. Reminding us of what Christ did, how He wrapped himself up in flesh, became man, and in a embarrassingly humble way, he entered this world. Christmas is a good time to express gratitude and kind wishes towards the people you care about. And we do care about all of you! You may not get a card this year because we can't seem to get our acts together and get a photo taken, and we're allowing ourselves the freedom to not stress out over sending out cards. We are thankful for the ones we get, and hold no judgement for the ones missing. I would much rather people spend their time less stressed. Don't stress about giving me a gift, don't stress about sending me a card. I value your sanity much more than any trinket. If you came up to me and said 'Chad, this year, instead of giving you a card or a gift, I just sat for five minutes and praised God for His awesome gift of Christ in my life"…. that would be the best gift of all!